Huber, Hunt & Nichols Inc.
Chase Field is a baseball park located in Downtown Phoenix, Arizona. 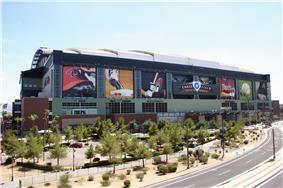 It is the home of the Arizona Diamondbacks, the city's Major League Baseball (MLB) franchise. It opened 18 years ago in 1998, in time for the Diamondbacks' first game as an expansion team. Chase Field was the first stadium built in the United States with a retractable roof over a natural-grass playing surface. The park was built during a wave of new, baseball-only parks in the 1980s and 1990s. Although nearly all of these parks were open-air, it was taken for granted that a domed stadium was a must for a major-league team to be a viable venture in the Phoenix area. Phoenix is by far the hottest major city in North America; the average high temperature during baseball's regular season is 99.1 °F (37.3 °C), and game-time temperatures well above 100 °F (38 °C) are very common during the summer. In the spring of 1994, the Maricopa County Board of Supervisors approved a quarter-cent increase in the county sales tax to pay for their portion of the stadium funding. This came about at a time that the county itself was facing huge budget deficits and lack of funding for other services. The sales tax being levied was very unpopular with local citizens, who were not allowed to vote on the issue of funding a baseball stadium with general sales tax revenue (usage of public subsidies for stadium projects was actually prohibited by a 1989 referendum). The issue was so controversial and divisive that in August 1997, Maricopa County Supervisor Mary Rose Wilcox was shot and injured while leaving a county board meeting by Larry Naman, a homeless man, who attempted to argue in court that her support for the tax justified his attack. In May 1998, Naman was found guilty of attempted first-degree murder. Costs for the stadium were originally estimated at $279 million in 1995, but cost overruns (in part because of rising prices for steel and other materials) pushed the final price to $364 million. As part of the original stadium deal, the Diamondbacks were responsible for all construction costs above $253 million. These extra expenses, combined with the Diamondbacks and their fellow expansion franchise, the Tampa Bay Devil Rays, not being allowed to share in the national MLB revenue for their first 5 years of operations, left the Diamondbacks in a less-than-desirable financial situation, which would come back to haunt team founder and managing partner Jerry Colangelo and his group later on. Construction on the park began in 1996, and was finished just before the Diamondbacks' first season began, in 1998. It was the third MLB stadium to have a retractable roof and the first in the United States (at the time, only Toronto's SkyDome, now Rogers Centre and Montreal's Olympic Stadium had them; others are now at Minute Maid Park in Houston, Miller Park in Milwaukee, Safeco Field in Seattle and Marlins Park in Miami). It was also the first ballpark to feature natural grass in a retractable roof stadium. The stadium hosted Games 1, 2, 6, and 7 of the 2001 World Series between the Arizona Diamondbacks and the New York Yankees. The Diamondbacks won all four home games, winning the world championship in seven games, and thus denying the Yankees a fourth consecutive championship. It was the first time since 1991 that the home team won all home games of a World Series. The only other incident was 1987, both by the Minnesota Twins. Chase Field was originally named Bank One Ballpark after JPMorgan Chase & Co., the name change was announced on September 23, 2005. 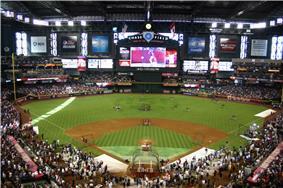 In March 2006, Chase Field played host to three first-round games of the World Baseball Classic. 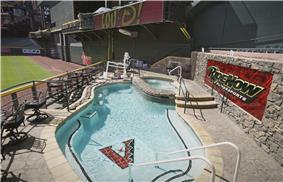 The pool at Chase Field as it appeared when it was sponsored by Ride Now Power Sports, current sponsoring is by Dodge. Chase Field also has a swimming pool sponsored by Dodge, located in right-center field, which is rented to patrons as a suite holding 35 guests for $3,500 per game during the 2011 season. Mark Grace was the first player to "splash" a home run into the pool. On September 19, 2013, after clinching the NL West, several members of the Los Angeles Dodgers climbed over the outfield wall and jumped into the pool after being asked by the Diamondbacks to not celebrate on the field after the game. In addition to baseball, the pool has been used by Monster Jam's Jim Koehler to continue his tradition of swimming after Freestyle. The ballpark also features a dirt strip between home plate and the pitcher's mound, one of only two current ballparks to do so (Comerica Park in Detroit is the other). This dirt strip, sometimes known as the "keyhole", was very common in old-time ballparks. The park's foul territory is somewhat larger than is the case for most ballparks built in the 1990s. With 80% of the seats in foul territory, the upper deck is one of the highest in the majors. The park's suites are tucked far under the third deck, which keeps the upper deck closer to the action, with the exception of their Dugout Suites which sit next to the home and visitor's dugouts. Before the 2008 season began, a brand new High Definition scoreboard was installed beyond center field, replacing the original. The new scoreboard is 46 ft (14 m). high and 136 ft (41 m). wide and it cost $14 million. It is the fifth largest HD screen in Major League Baseball behind Kauffman Stadium. The screen at Kauffman is larger by overall area and is square in shape but Chase Field's screen is larger by length and is rectangular. Premium seating includes 4,400 club seats, 57 suites, 6 party suites, Executive suite, batters box suite, two dugout suites, and the Ramtrucks.com Party Pool. The Diamondbacks and St. Louis Cardinals game on April 3, 2013 lasted 16 innings. It was the longest game in Chase Field's 17-year history. The organizers of the Insight.com Bowl elected to move their game from Arizona Stadium in Tucson to Phoenix beginning in 2000, and Chase Field became the game's host. In 2006, the bowl game moved to Sun Devil Stadium, to replace the Fiesta Bowl, which moved to University of Phoenix Stadium in Glendale, Arizona. The football configuration was notable because of the lack of nets behind the goalposts and the dugout behind the south end zone. The final Insight Bowl played at Chase was between the hometown Arizona State Sun Devils and the Rutgers Scarlet Knights. The stadium also hosts occasional concerts and international soccer games. For football and soccer, the field is set up with the end lines perpendicular to the third-base line and temporary bleachers added on the east side. Chase Field has staged nine women's college basketball games. The second game, which was played on December 18, 2006, was shortened by rain with four minutes and 18 seconds remaining and Arizona State leading Texas Tech 61–45. Venue staff closed the roof in an effort to finish the game, but officials deemed the court unsafe. In 2000, ASU played Tennessee Volunteers at the same facility. Chase Field was also the site of the "Challenge at Chase", a college baseball game between Arizona State and University of Arizona. Arizona won both contests. There has been no game scheduled there since 2008 . In February 2006, the Professional Bull Riders hosted a Built Ford Tough Series bull riding event at this venue. Chris Shivers won this event with a total score of 181.5 points (out of a possible 200) on two bulls, including an impressive 93.75 (out of 100) points on Taylor Made bucking bull, Smokeless Wardance, in the short-go round. During the long-go round, the roof was closed, but during the short-go, the roof was opened. The stadium has hosted Monster Energy Supercross rounds from 1999 to 2015. Monster Jam comes to Chase Field every year in late January about two weeks after Monster Energy Supercross. Chase Field's roof is opened or closed depending on the game-time temperature. When the decision is made to close the roof, it is left open for as long as possible before game time in order to keep the grass growing. Even when the roof is closed, the park's windows allow enough sunlight to play in true daylight without overheating the stadium. The roof, which takes just 4½ minutes to open or close at a cost of $2–$3, is closed three hours before game time using two 200-horsepower motors triggered from a control room in the upper deck above left-center field. A massive HVAC system then drops the temperature inside the park 30° by the time the gates open. The cooling system, which has the power equivalent of cooling 2,500 homes of 2,000 square feet, uses chilled water and is part of the same system that serves more than 30 buildings in downtown Phoenix. The cooling plant is located in a separate building right outside the ballpark. Originally, the HVAC system didn't work above row 25 of the upper level, exposing fans in the higher rows to the full force of the often-oppressive heat typical of Arizona summers. Recent changes keep virtually all of the facility in air-conditioned comfort. Chase Field is served by Westbound METRO Rail's Washington at 3rd Street station and Eastbound METRO Rail's Jefferson at 3rd Street station. ^ "D. Baxter the Bobcat". ^ "AllVenueTickets". Retrieved November 19, 2014. ^ "MLB-Stadiums.com: Chase Field". Retrieved April 14, 2014. ^ a b c d e Dodd, Mike (July 12, 2011). "Diamondbacks Are Experts at Keeping Heat at Bay". ^ Lowry, Philip (2006). Green Cathedrals. Walker & Company. p. 182. ^ Craven, Scott (April 3, 2008). "Chase Field Offers D-Backs Fans A High-Def Welcome Back". ^ Garcia, José E. (December 19, 2006). "Sun Devils Brave Elements to Win". John Pierpont "Jack" Morgan, Jr.